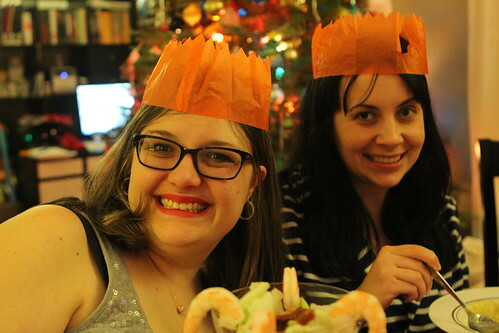 This year, for the first time ever, Jen and I did not travel for Christmas or go home. While this was sad it was also exciting to have our first ever Christmas at home. There is much to be said for being the guest on Christmas. Just showing up somewhere, lounging around, and eating all the food is notably easier than being the host. This is particularly true when you are simultaneously caring for two babies. On Saturday Paul and Caolan stopped by briefly to pick up Paul's forgotten jacket from our idiotic White Christmas themed dinner. They took the opportunity to play with the boys an their new ball, the price for us securing Paul's jacket for a few days and buying Jen a few minutes of rest while I was at work. I was also at work on Christmas Eve while Jen watched the boys. It was a typical round of lousy napping from Martin. While Elliott went to sleep immediately Martin spent his time trying to rip off the few remaining sheep from his mobile. 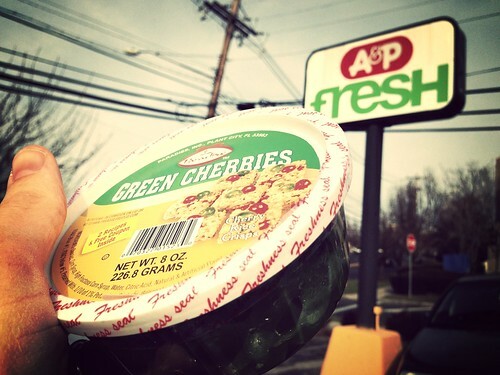 After work I headed to a nearby grocery store to try to find green cherries, the last ingredient we needed for Christmas cooking. I came up empty then hit three more stores on my way home and finally located a container in a shoddily maintained display next to some bananas. Sadly I had to go out about six or seven more times to get cream, milk, eggs, sausage, flour, and brown sugar. Normally I pride myself in being well prepared for the holidays but I guess the distraction and chaos of having two babies at home interfered with my normal excellent planning. 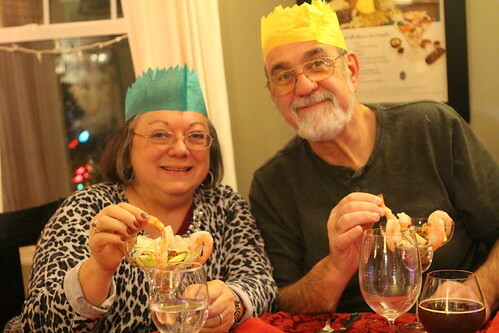 Not having actually decided on a menu for Christmas Day didn't help matters. 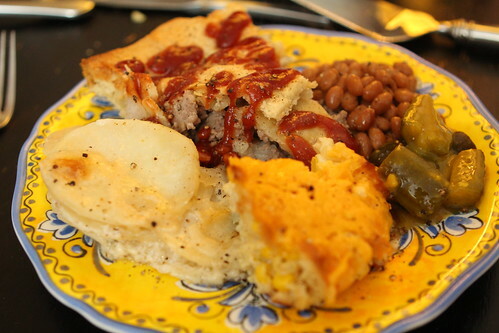 Jen got a very late start on cooking dinner after I got home but was still able to make tourtière, scalloped potatoes, baked beans, and clam corn casserole which we served with mustard pickles. This wasn't done without some level of stress but it was done and that's the important thing. We were able to have this around 9:00 after feeding and bathing the Wombats and reading them A Visit From Saint Nicholas. 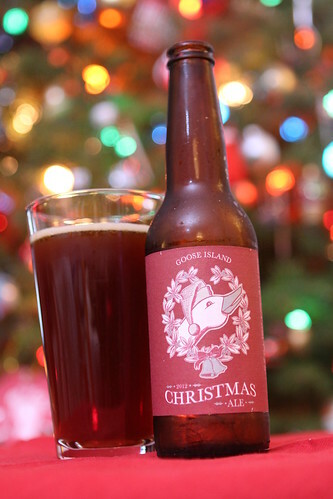 Then, after a dreadful three hour stretch of cleaning and organizing, we were able to sit back and enjoy the tree with a Christmas Ale from Goose Island Brewery. It was a very nice beer but not enough to keep me awake through the entire glass. Sadly I fell asleep on the couch with about a third of the glass remaining undrunk. The Christmas Ale from Goose Island put my beer spread sheet over 500. I've been keeping a spreadsheet since 2011 of all the beers I've tried so I'm pretty close to averaging 250 a year. That's right, I'm that cool. In my eyes nothing is really worth doing if there isn't a spreadsheet involved. Christmas morning was a morning like any other except that I wore my Christmas sweater and reeled from exhaustion. To the Wombats it was a morning just like any other as well except they had to dodge a huge number of gifts while they zipped around in their walkers. 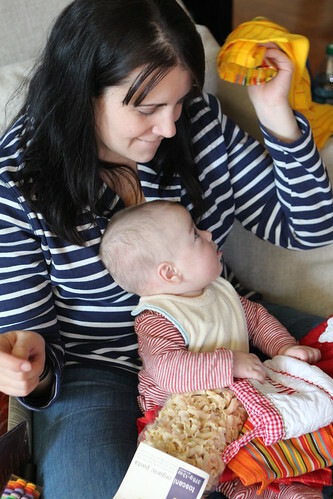 Jen got to work in the kitchen making her sausage breakfast strata while I distracted the babies with toys and my own award-winning renditions of popular Christmas songs. Actually, it was mostly unpopular Christmas songs like Pat-a-Pan by the Harry Simeone Chorale off of the 1963 album The Wonderful Songs of Christmas. 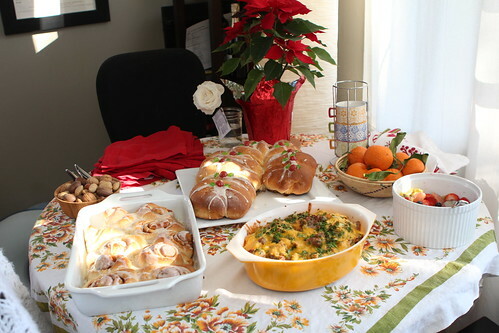 We put out brunch just before my parents and Jen's sister arrived featuring the strata, cinnamon buns, and fruit salad. 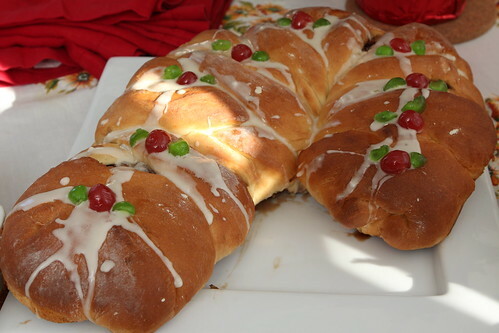 There was also this candy cane bread. Jen was not super-thrilled with how it turned out. We got a particularly active batch of yeast so that the dough was swelling out of control almost immediately after mixing. We frantically added extra flour and Jen kneaded it but after braiding it it swelled to the point where we threw it into the oven in hopes of controlling its imperial expansion. 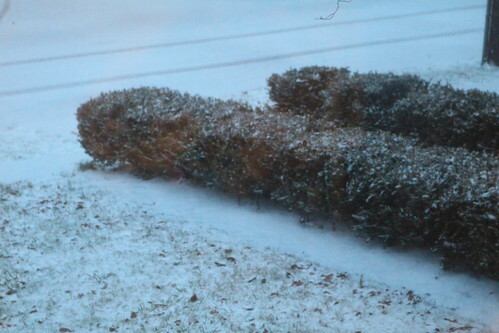 Jen said that it didn't look like a candy cane at all but rather like a Christmas slug. At any rate it was a delicious slug-shaped bread. After Lauren and my parents unloaded all of their gifts there was precious little room to navigate our living room. Each year we are filled with simultaneous joy for how lucky we are and embarrassment for how obscene our collection of gifts seems to be. Nana STIM did not waste any time grabbing Martin. After eating brunch Martin got to licking Grandpa Butch's fingers of the last bits of remaining cinnamon roll frosting. It's easy to miss snuggling with your own children but yet it is extremely liberating to be at home and not be 100% tied down. This gave me the freedom to do all sorts of things around the house. This is why I would like to petition to have guests as close to daily as possible. 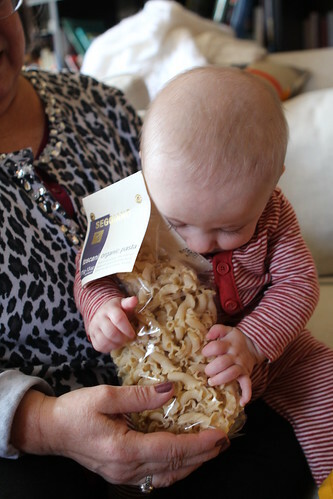 There were many gifts exchanged but Martin and Elliott's favorite was this bag of pasta that we gave Lauren in her stocking. They fought with each other over who would get to play with it next. 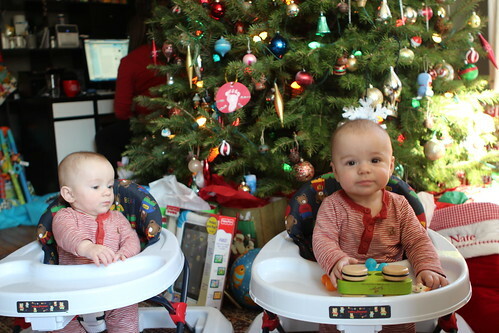 This garnered more of their attention than any other item under the tree. Before dinner I poured yet another Christmas beer, this 5 Golden Rings from The Bruery. It was very different, brewed with pineapple and spices, and was extremely potent. I forgot to tell Jen the alcohol content was 11.5% but she was quick to identify that this was not a traditional lager. After opening presents Grandpa Butch used one of the Wombats' sheep puppets to entertain them which was a smashing hit. 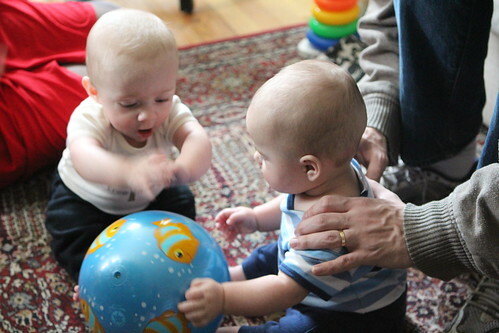 This kept them occupied and laughing for about thirty minutes as my dad crafted a story about how the sheep was from Mars or outer space and the tales of him coming to earth to steam babies' bellybuttons. He's negotiating movie rights as you read this. 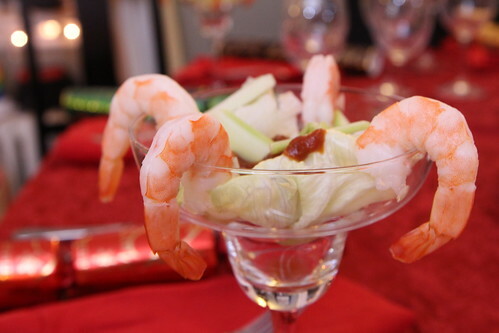 We started off dinner with Jen's family's traditional shrimp cocktail starter. I made broccoli, potato, and cheddar soup for Lauren. 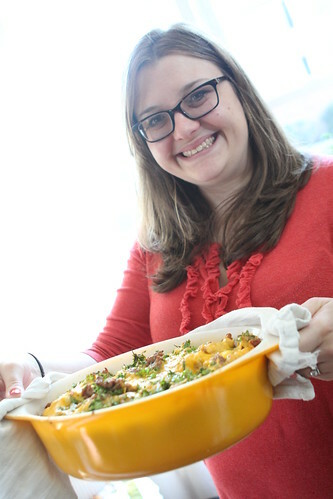 I made an enormous pot for her to last her the week given her love for broccoli, potatoes, and cheddar. 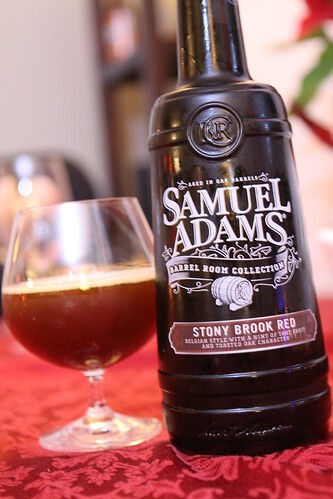 With dinner I opened this bottle of Stony Brook Red from Sam Adams's Barrel Room Collection. It was a very nice, oaked, slightly sour beer. 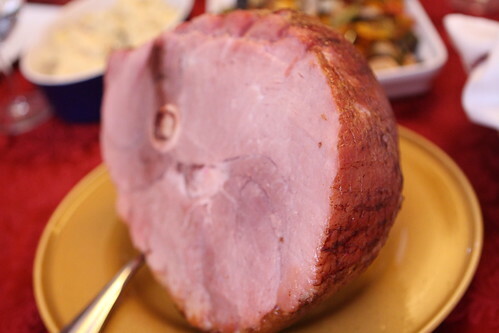 For dinner I made an excessively large eight pound ham for the four adults who eat ham. It was the smallest ham I could find. This alone would have been enough but I also made carmelized creamed pearl onions, mashed potato, mashed rutabaga with carrots and potato, and roasted root vegetables. We served this up with Jen's rolls. 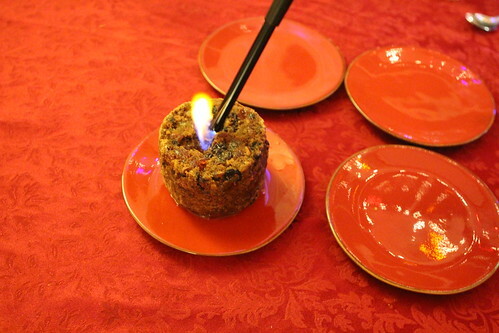 After dinner I attempted to flambe the plum pudding per Jen's request but for some reason it would only ignite if I held the lighter in place. It was not a very impressive presentation. Before putting the Wombats to bed we posed with a few pictures before they lost their minds from the excitement of the day catching up with them. Dinner was great. One-by-one we started to fade and drop off into sleep and, surprisingly, I outlasted everyone. This is rare these days and yet something else to be thankful for this Christmas. 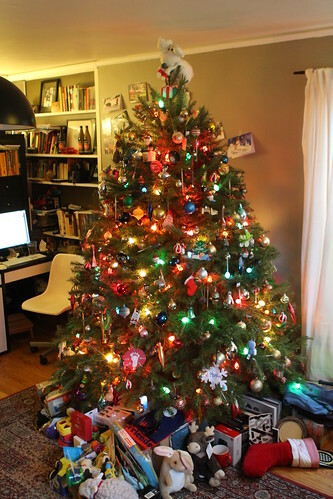 This morning Jen got to one of her favorite tasks: organizing the gifts under the tree. She did an admirable job. Lauren took on the task of supervising the Wombats. I supervised the supervising. 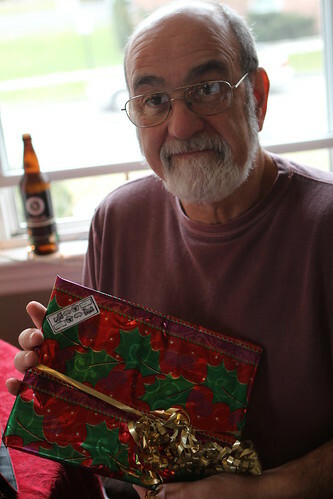 While organizing Jen even found another gift for my father. Who says Christmas only comes once a year? The boys got some sweet sunglasses as gifts and Elliott did an uncanny Elvis impersonation once he put them on. 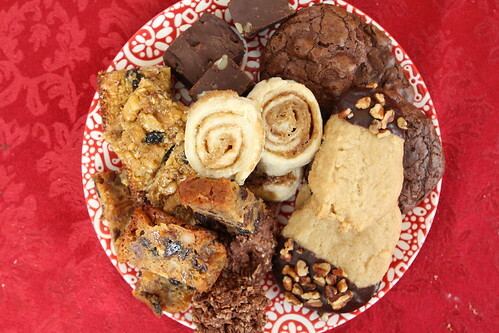 After a lunch of leftovers Jen put out a plate of her Christmas cookies. After Nana and Grandpa left it immediately started snowing and the wind whipped around at the windows with the hard clattering of icy rain. The lights even flickered prompting us to ready our Hurricane Sandy memorial flashlights. My parents had brought up this little weeble-wobble-esque Santa which was my first ever Christmas present. The Wombats had a great time throwing it around and batting it, enjoying the peaceful tinkling noises it made. After getting those monkeys to bed we had a large amount of leftovers as well as this Krampus Helles Lager from Southern Tier Brewing Company. The Krampus, if you are not familiar, is a horrific tale of a hideous creature that looks like Randall Flagg that finds all the naughty children at Christmas and takes them off into the night presumably to torture them to death. It's a terrible tale that could only have been dreamed up in the folklore of the early Germans. Only an old and barbaric tradition could dream up such a terrible fate for children who behaved poorly. Personally I think the threat of not getting that skateboard that you really wanted should be motivation enough without having to threaten the lives of children. Horrific tradition, pretty good and unusually strong lager. Rub-a-dub-dub, thanks for the grub.